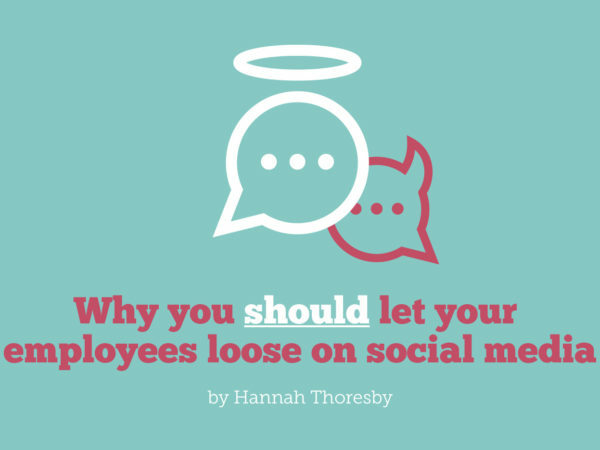 For a long time, internal communicators were seen merely as internal messengers whose sole job it was to cascade half-baked comms across the entire workforce at the drop of a hat. But that’s starting to change. Internal communication and leadership expert Per Zetterquist puts forward his case for why he believes IC should be less about simply crafting messages – and more about inspiring positive behaviour change. When it comes to internal communication, some say that content is king. I say that actions are more important. But why? Because we’ve known for a very long time that actions speak louder than words. And yet we continue to obsess over our texts, chop and change our manuscripts, and adjust the smallest details in our power-point slides. 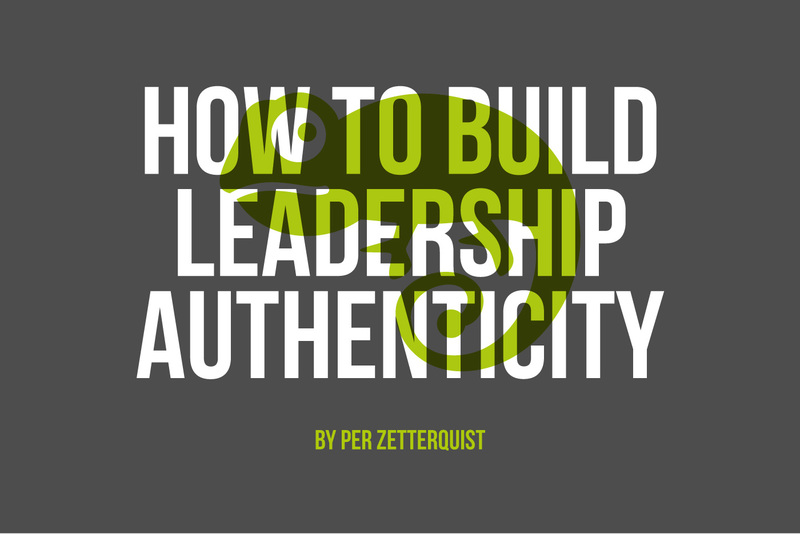 The number-one thing for internal communicators to focus on is helping leaders to become truly genuine in their communication with the organization. 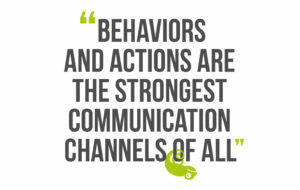 And what communicates more powerfully and genuinely than our actions? 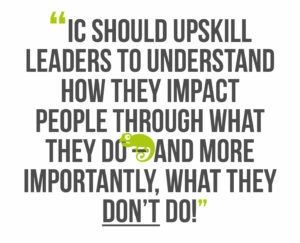 This means that IC support should concentrate on upskilling leaders to see and understand how they impact people through what they do – and sometimes even more importantly, what they don’t do! In practice, this relies on supporting them to think through what the new business strategy, or new set of values for example, means in terms of actions for the new ways of working. Three things we need to start doing, three things we need to do differently, and three things we need to stop doing so that people see, experience and understand the changes that the leadership team want to flourish. 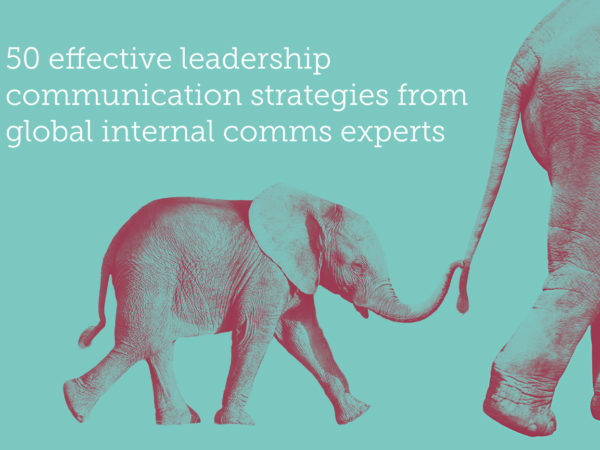 Get advice from 50 global IC experts on how to transform your senior leaders & managers into exceptional communicators. 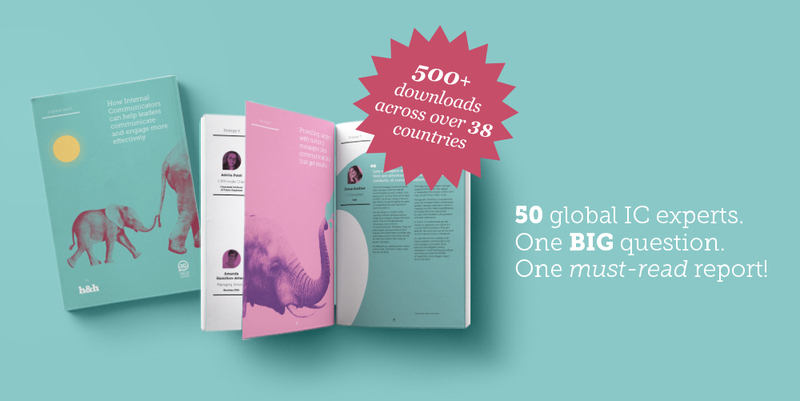 Download our FREE global report for insights, advice and pointers on how to work with senior leaders & managers to build communication confidence and capability at the top. It makes me wonder – how come we spend so much time crafting messages, designing PowerPoints and rehearsing communication with senior leaders, and then leave it up to them to translate everything they say to the bottom line into the actions they take every day (or indeed, don’t take)? 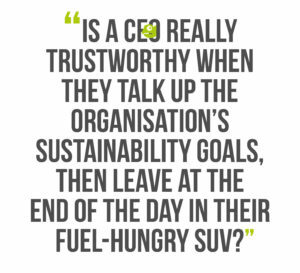 Is a CEO really trustworthy when they talk up the organisation’s sustainability goals, and then leave at the end of the day in their fuel-hungry SUV? And equally, is the chairman of the board authentic and genuine if they promote a commitment to solving societal ills when the company only pays its people the minimum wage? Those of us devoting our professional lives to advising senior leaders on their communication ought to think less about how messages look and sound. Rather, we need to think much more about how their day-to-day behaviors are interpreted internally and externally. 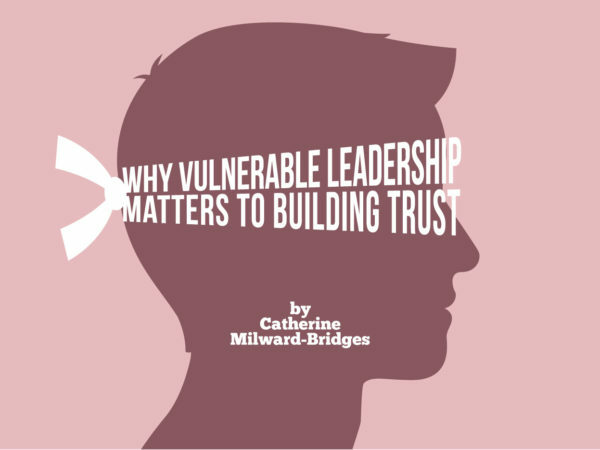 For example, senior leaders can’t talk about the need for everyone in the organization to make sacrifices in tough times while their yearly bonuses remain exactly the same. I say our job is to make sure messages and everything we call ‘content’ is corresponding with reality. We need to understand that actions speak much louder than words. Taking this on as our professional mission will not be an easy task. It will, for sure, be challenging, and I imagine it will thrust us way outside our comfort zones where we have often been left alone to perfect some comms from the CFO or design a compelling PowerPoint presentation. I think if there’s one tool that will enable us to become truly influential communication advisors, it’s the ability to guide and influence other people’s behaviors and actions, since they are the strongest communication channels of all. Forget intranets, townhall meetings, and Q&A sheets. Instead, consider the behaviors that would be appropriate for senior leaders to role-model in order to set a positive example for the bottom line, and teach them how to embody them in their day-to-day activities. During our younger years we learn to copy the behavior of the people around us, and come to see those people as role models for how we should act ourselves. It starts with our parents, and continues throughout our life. 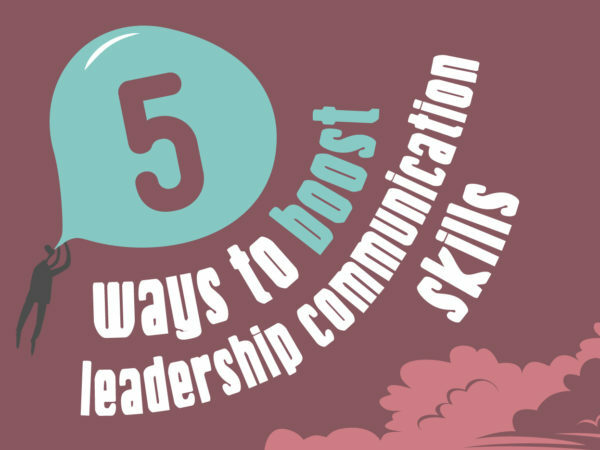 Senior leaders who are aware of their influence on others should first ask internal comms professionals for advice on how to conduct themselves, and then what to communicate in order to encourage behaviour and attitude change in their employees. But as IC experts, can we craft a communication initiative for our organizations stressing the importance of visible leaders, without encouraging our CEO to have lunch in the canteen a few times a week rather than ordering food to their office? My sense is that, in recent years, we as a profession have at large been backing off from many of these critical comms aspects, focusing our talent and time on various channel-related matters connected to the growth and advancement in technology. 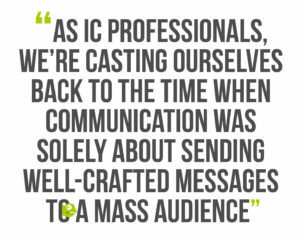 Not to say this is unimportant, but to my mind it casts us back to the time when communication was about defining a sender and making sure they had a well-crafted message to transmit to an audience. In the early days, this was enough to make a communication function look useful. But if anything, things have got worse in the last couple of years because of the explosion in channels through which we want our leaders to be visible. We can distribute visuals and messages in every fashion and format nowadays, to a global workforce. That is exciting. But what is the extent of its impact? I say we need to take top executives out of the channels and make sure they become genuine and authentic to people in real life, building a presence in the organization based on the power of positive and inspiring behavior. Instead of giving them a pack of PowerPoint decks through which to share information with employees, we need to make sure they have sincere conversations with employees in order to demonstrate their actions and behaviours up-close for people to model in themselves. Have them discuss and decide on three things that will best illustrate the desired new ways of working. Have them pick three things to do differently with the same purpose. And finally, have them agree on three things to do differently to show how the culture has changed. The beauty in this is not only that the impact will come from behavior instead of smart wordsmith-ing. But also that influencing through behavior is something that can take place all the time, and it can easily be observed by anyone, compared to a comms activity that is planned and carried out according to a schedule and in fashion chosen by the IC function. Behavior is genuine communication. A communication initiative is staged communication. At the end of the day, people will take notice of and follow what they feel is authentic, as opposed to what they feel is contrived. And I feel this is as good a reason as any to change our focus from message crafting, to behavior facilitating. 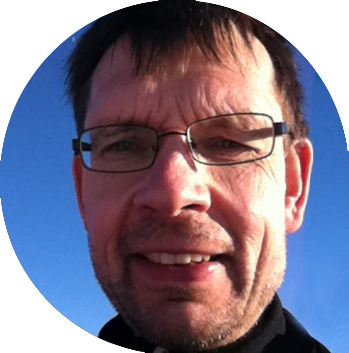 I am a communication executive with 30 years’ experience in executive and senior positions in international business and politics. I’m passionate about leading change, with a strong focus on leadership and communication. I’m currently serving as a senior advisor offering mentoring & coaching, change management expertise, leadership training and interim support. Did you know we’ve got a dedicated leadership-development team, who have equipped no less than 104,748 leaders worldwide with the skills to communicate and engage effectively over the last 12 months? Get in touch today to find out how we could help you transform your leaders and managers from average, to exceptional! Got a brilliant idea you simply can’t keep to yourself? We’re always looking for fresh faces to help us further the IC conversation by writing guest articles for our blog. If you want to make your voice heard on internal comms, employee engagement, change management or leadership development, we’d love it if you got in touch!